Santiago Medallion, patron saint of all horses. The Gorgeous Horse, number one source for Santiago jewelry. Here we have the Santiago Medallion in white gold. 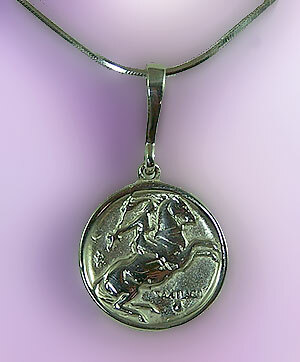 The Santiago Medallion is patron saint of all horses. Enjoy this pendant daily and keep it close to your heart. This pendant features an Omega bail great for larger necklaces and chokers. Dimensions: 3/4 inches in diameter.